OYEM, Gabon — Holders Ivory Coast failed to win for the second time at African Cup of Nations 2017, following a 2-2 drew with DR Congo in Group C on Friday. DR Congo led twice, but couldn’t hold on to their lead, as the defending champions responded twice. DR Congo struck first in the 9th minute when Neeskens Kebano fired home a right-footed shot into the bottom corner of the goal, following a layoff pass by Junior Kabananga. Ivory Coast grabbed an equaliser in the 26th minute when Wilfried Bony headed home from a corner kick. Max Gradel floated a nice delivery inside the box from a corner kick on the left side and Bony leaped high to head home into the bottom corner of the goal. Two minutes later, though, DR Congo retake the lead through a superb header from Kabananga. Firmin Ndombe Mubele got the better of his marker on the right side to send in a cross, which was powerfully headed home from six-yards out by an unmarked Kabananga, who immediately ran over to celebrate and dance with the supporters. Shortly after the hour mark, the Ivorians got back into the game again when captain Serey Dié drove forward and blasted a shot that took a big deflection off a DR Congo defender and went past goalkeeper Ley Matampi into the bottom corner of the goal. 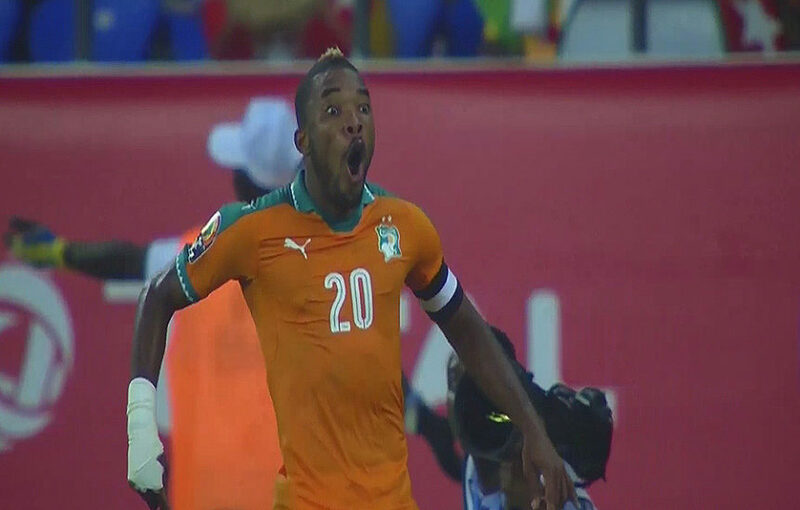 Substitute Salomon Kalou had the ball in the back of the net for the Ivory Coast in second half stoppage time, but the goal was immediately ruled out after being flagged offside. Despite the draw, the Congolese remain top of Group C with four points, following the 1-0 win over Morocco in their opener, while Ivory Coast are on two points.